With the advent of augmented reality, it is possible to do even more with your smartphone. These include applications such as Ikea Place, which allows the brand's furniture to be placed in an environment to get a preview of the look and feel before buying. But there is a domain where Google and Apple are fighting a little silent war: it's in measurement applications. And just as a matter of fact, Google has just officially released its own (before Apple) which is simply called Measure. 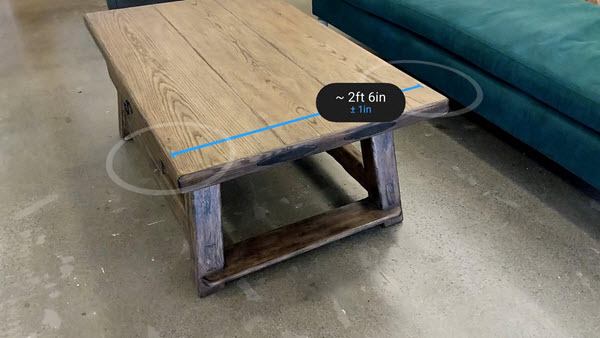 Measure uses Google's ARCore platform, a platform that allows you to create augmented reality experiences. Several applications already exist, including Ikea Place, mentioned above, but also games such as Just A Line, designed by Google Creative Lab. Measure's aim here is to successfully understand space in order to be able to take measurements from his smartphone. The operation is very simple: simply point the device at the object you want to measure and pass it over the object to see a measurement scale appear. It is then simply adjusted to obtain the required size. It is possible to take pictures with the displayed measurements but also to switch easily from one unit of measurement to another. Obviously, not all devices will be compatible: only the most recent models will be able to benefit from Measure. Apple, for its part, should offer a similar application with iOS 12, the final version of which would be released in early autumn. Lux Meter is an application that uses your smartphone's light sensor to calculate the brightness of a surface.